The Adidas Brazuca, being used in the 2014 FIFA World Cup quarter final between Brazil and Colombia. The Adidas Brazuca was the official match ball of the 2014 FIFA World Cup, which was held in Brazil. It is designed by the company Adidas, a FIFA Partner and FIFA World Cup official match ball supplier since 1970. The name of the ball was revealed on 2 September 2012. It was selected by a public vote organised by the Local Organising Committee and Adidas, with over one million Brazilian football fans voting. The name Brazuca was chosen with 77.8% of the vote. Two other voting options were given: Bossa Nova (14.6% of the vote) and Carnavalesca (7.6% of the vote). According to FIFA, "the informal term 'brazuca' (our fellow) is used by Brazilians to describe national pride in the Brazilian way of life", and "mirroring their approach to football, it symbolises emotion, pride and goodwill to all". The term is also used as slang for "Brazilian" and became well-known abroad due to the Brazilian diaspora. Iran striker Reza Ghoochannejhad heading Adidas Brazuca in the Group F match against Argentina. The ball is a developmental successor to the Adidas Tango 12 series of balls, with the same bladder and carcass but a different surface structure. The ball weighs 437 grams and has a circumference of 69 centimetres. The ball has been made of six polyurethane panels which have been thermally bonded; the reduction in the number of panels is claimed to increase the consistency in the ball. The Brazuca ball has been stated to avoid aerodynamic problems with the Jabulani ball used in South Africa for the previous World Cup. It is textured to feel more like the Adidas Finale 13, the official UEFA Champions League ball, than the Jabulani. The Adidas Brazuca Final Rio used in the 2014 FIFA World Cup Final. The ball has a multi-colour design referenced from the traditional wish bracelet to represent Brazil. The colours used in the match balls are blue, green, red, white and black. The match ball for the 2014 FIFA World Cup Final, announced on 29 May 2014, featured a variation of the Adidas Brazuca named the Adidas Brazuca Final Rio. Whilst the technical aspects of the ball are the same, the colour is different from the Brazuca balls used in the group stages and other playoffs, with a green, gold and black colouring. It is the third special ball for FIFA World Cup final matches, after the +Teamgeist Berlin (2006) and the Jabulani (2010). The Brazuca went through an extensive testing process before its use at the World Cup. Adidas had been developing the ball for over 2 years, and had worked with many teams and players to ensure the ball was acceptable. The ball has appeared in the FIFA U-20 World Cup, DFB-Pokal final as well as disguised as the Adidas Cafusa in international friendly matches. Each team participating in the World Cup finals were delivered a set of Brazuca balls after the unveiling in December 2013 to have sufficient time to practice with it. Several Brazuca balls, at the friendly between Algeria and Armenia in 2014. The original Brazuca balls for the World Cup finals were contract manufactured in Pakistan, however bono fide replica balls are made in both China and Pakistan. Taipei-based Long Way Enterprise were originally asked to manufacture the ball in their subsidiary YaYork Plastic Products in Shenzhen, Guangdong province, China. The company has been associated with production of Adidas balls since 1997. Long Way, however, was unable to meet the high demand for the ball. A second supplier, Forward Sports (based in Sialkot, Pakistan), was brought in to help manufacture the ball. Forward Sports, who have been associated with Adidas since 1995 and already supplied footballs for both the UEFA Champions League and the German Bundesliga, were awarded the contract by Adidas at short notice after the original manufacturer in China failed to meet the demand. Over 42 million Brazuca balls were exported from Sialkot. Each ball is expected to be sold for around US$160. 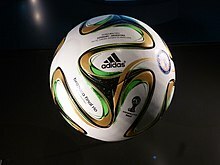 Adidas unveiled the Brazuca at a launch event on 3 December 2013, two days ahead of the traditional unveiling of the World Cup match ball at the draw of the group stages of the World Cup Final. The launch event took place in Rio de Janeiro at Parque Lage and featured a 3D light projection, which revealed the Brazuca to everyone in attendance. On 7 December 2013, Major League Soccer announced a FIFA-approved version of the Brazuca as the official match ball for the league's 2014 season. The following competition used Brazuca ball which was also used in the World Cup, unless named different. Replica Brazucas were sold worldwide, with the traditional hexagonal design, for far cheaper than the official Brazucas. ^ a b c "adidas Brazuca – Name of Official Match Ball decided by Brazilian fans". FIFA.com. Fédération Internationale de Football Association. Retrieved 3 September 2012. ^ a b c d e f g h i j k l m n "Brazuca – an icon is born". Adidas. Adidas Group. Archived from the original on 2 July 2014. Retrieved 14 June 2014. ^ a b c "adidas brings brazuca into the world". FIFA.com. Fédération Internationale de Football Association. 3 December 2013. Retrieved 4 December 2013. ^ a b "Nome da bola da Copa é escolhido pela primeira vez por torcedores: Brazuca" (in Portuguese). Globo Esporte. Retrieved 2012-09-03. ^ a b "adidas brazuca – tried and tested". FIFA.com. Fédération Internationale de Football Association. Archived from the original on 2017-05-02. Retrieved 27 April 2014. ^ a b "Brazil ready for 'Made in Pakistan' 'Brazuca' balls". Emirates24/7. 7 June 2014. Retrieved 8 June 2014. ^ Leswing, Kif (9 December 2013). "Feet-On With Adidas' Newest World Cup Ball, the Brazuca". Wired. Retrieved 17 December 2013. ^ "The science behind the 'Brazuca': World Cup 2014 ball set to surpass the Jabulani". Mail Online. ^ a b c "adidas Brazuca Final Rio unveiled". FIFA.com. Fédération Internationale de Football Association. 29 May 2014. Retrieved 14 July 2014. ^ "adidas unveils brazuca, the official ball of the 2014 World Cup". SBNation.com. Retrieved 2014-06-12. ^ a b c Howells, Richard (2014-06-11). "World Cup 2014: Adidas "Brazuca" Ball Scores With Fans". Forbes. Forbes. Retrieved 14 June 2014. ^ "China finds way to play in Brazil". 13 June 2014. Retrieved 14 June 2014. ^ Dreyer, Mark (11 June 2014). "Your World Cup In China Viewing Guide: Dates, Times, And Chinese Characteristics". Beijing Cream. Retrieved 14 June 2014. ^ Ghani, Faris (23 May 2014). "The hands that formed the Brazuca". Al Jazeera English. Retrieved 14 June 2014. ^ "Making the official ball for the 2014 FIFA World Cup". Retrieved 24 April 2014. ^ Zhang Jingya. 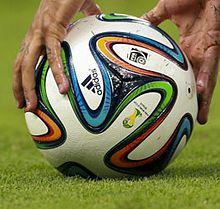 "World Cup ball: Pakistan launches the "Brazuca" - CCTV News - CCTV.com English". Retrieved 2014-06-12. ^ AFP. "Football: Sialkot workers fire 'Brazuca' ball to Brazil – The Express Tribune". Tribune.com.pk. Retrieved 2014-06-12. ^ "SAPVoice: World Cup 2014: Adidas "Brazuca" Ball Scores With Fans". Forbes. 2014-05-28. Retrieved 2014-06-12. ^ "adidas Brazuca - 2014 World Cup Ball". Footy-Boots.com. Footy-Boots.com. Retrieved 3 December 2013. ^ "Bring on the Brazuca! New World Cup ball for Brazil is unveiled... so why won't England use it until next summer?". Daily Mail. 3 December 2013. Retrieved 4 December 2013. ^ "2014 adidas MLS Match Ball: League to debut new Brazuca design". mlssoccer.com. MLS soccer.com. 7 December 2013. Retrieved 17 June 2014. Wikimedia Commons has media related to Adidas Brazuca. This page was last edited on 28 December 2018, at 21:33 (UTC).